So I meant to post this a few days ago but then I was attacked by a sinus infection that just wouldn't go away. Now that I'm feeling a better and passing out candy to the kids I thought I should write this up. In the three years I've belonged to Goodreads I've never joined any of the many groups they have. Mostly because I really only use the site to keep tracking of my yearly reading, shelf books that some day I want to read, and to just find new books I wouldn't find otherwise. Until last week. 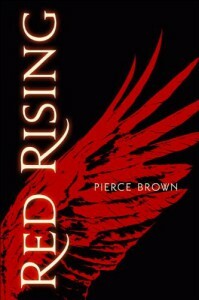 Pierce Brown, and Del Rey Publishing, is holding a four week re-read of Red Rising. Only I'm using it is as an excuse to finally read start the series. Red Rising has been on my to-read list for quite sometime and I've just never picked up, but that's only the carrot that pulled toward the event. The structure of the re-read is the stick that stuck me into joining the group. It's not just another group of lets re-read this amazing book and talk about it. Pierce Brown and Del Rey have split the book up for the course of four weeks that will work wonderfully for me. This schedule works great because I can use my breaks at work to read each part and be active in the discussions on Goodreads. Without having to read an entire book in one week, which I could normally do but hello NaNoWriMo. This group is also another way I'm trying to break out of my socially awkward bubble and be more involved with the reader, and book, community. I also want to post a write up on my blog of each section over the next four weeks as I finish each section. It'll be a bit more in depth of than what I'm posting on the Goodreads boards. A little more in depth on my reaction as each piece unfolds. Hopefully with as few spoilers as possible. So far I've managed to stick to the schedule they posted for the reread, and will hopefully have Part I posted in the next couple of days. I just need to get my thoughts in order, but I'm really excited to dive further into this book. So far it's been a nonstop ride, but more of that later.